Reclaim your space and earn! Could it be..? Is it…? Might it be Spring..? Well the weather reporters aren’t sure but here at Storenextdoor HQ, we say YES! We’ve had enough of the waiting and have decided it’s time to get pro-active. If the weather can’t spring itself then we need to jailbreak it. So, this week we’ve been dusting off the dusters, and stocking up on the Marigolds in preparation for a Big Spring Clean – after-all, if the last six months are anything to go by, there’s money to be made! It’s true, we’ve had so many enquiries about storage space since we launched last November that we are running low on the supply side. So – this is where you come in..! If you have suitable spare space (or if you know someone else who does) then it’s time to get busy. Garages, loft spaces and basements or undercrofts are all proving to be popular storage spaces with the average rental per space around £90 a month (up to £250 for more than one space and you can list up to five at a time). This means that your garage that is currently full of junk [how long since you went on that ancient rowing machine…?] could be making you around £1000 a year! But where to put all the stuff? I hear you protest. Well, we’ve thought of that too and have teamed up with the UK’s largest junk removal company Anyjunk to get you a 10% discount for rubbish collection and removal. 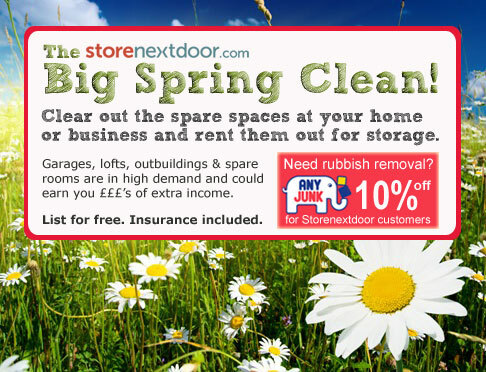 Just mention you that you have signed up at Storenextdoor when you contact them to qualify for the discount. Feeling inspired? Great! Come and join in the Big Spring Clean. You can start by seeing how much your space could be earning you with our Earnings Estimator. I’m always on hand if you have questions or need help with a listing.